Any trade facilitation project is likely to cross organizational boundaries and involve experts from more than one domain. Thus the project sponsor must be in a position to ensure cooperation between domain experts and provide overall direction for the work. 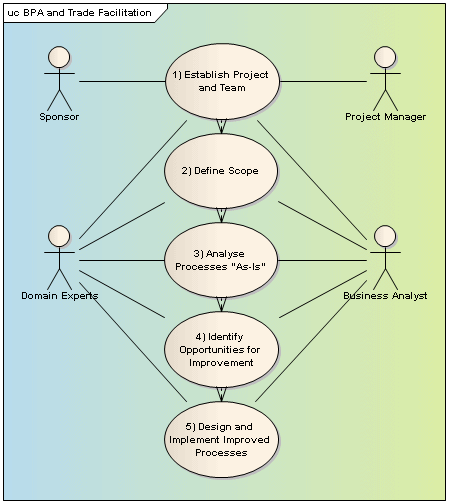 Stakeholders participating in the business process analysis study can be categorized into four groups, as shown in the Figure (see also Table 3.1 [BPA-Guide UNNEXT]). 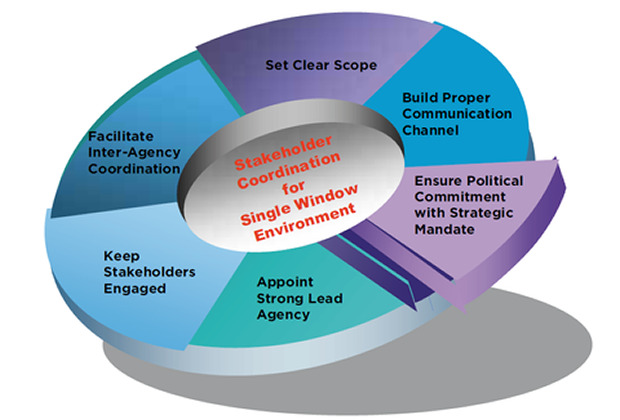 Each stakeholder category carries specific roles and responsibilities within different parts of the analysis process that are shown in Figure below. Detailed project plan including human resources, schedules and software supported tools. Set up the team consisting of process analysts with critical thinking, good personalities and sound interpersonal skills. Do not underestimate the effort required and problems in scheduling certain tasks, especially those relating to human interactions, e.g. data collection and verification. The next stage of the BPA process is to define the scope of the project. Refer to the Process Analysis Methodology to learn more about the deliverables and responsibilities of the roles in each phase.